On August 7, 2011, former Pennsylvania Railroad type E8A diesel units No. 5711 and No. 5809 are passing through the borough of Greenville in Mercer County, Pennsylvania on the former Erie Railroad now Norfolk Southern Railway on a rail excursion in this photograph by the author. The Erie and Pittsburgh line of the Pennsylvania Railroad once served Greenville. 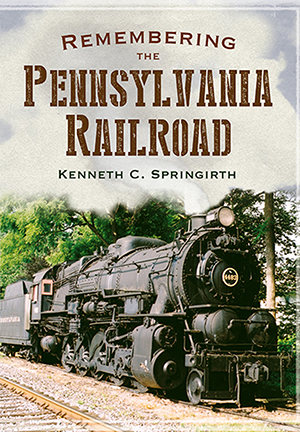 Kenneth Springirth, with a lifelong interest in rail transportation, has been researching the Pennsylvania Railroad since 1960. Born and raised in Philadelphia, Pennsylvania, he commuted to Drexel Institute of Technology (now Drexel University) in Philadelphia by trolley car, subway, and sometimes Pennsylvania Railroad commuter train. His father was a trolley car motorman in Philadelphia, and his grandfather was a trolley car motorman in Washington D.C. This book is a photographic essay documenting the Pennsylvania Railroad, which considered itself the standard railroad of the world. Classic scenes of the Pennsylvania Railroad's amazing GG1 electric locomotives operating on the most successful electrification project in the United States are included. This book provides an insight to an extensive railroad system that survives today with the Norfolk Southern Railway owning much of former mainline trackage in Pennsylvania and Amtrak owning the Northeast Corridor plus trackage between Philadelphia and Harrisburg. In addition, there are a variety of regional and shortline railroads that contribute to Remembering the Pennsylvania Railroad. Kenneth Springirth, with a lifelong interest in rail transportation. Born and raised in the United States, he commuted to Drexel Institute of Technology (now Drexel University) in Philadelphia by trolley car, subway, and sometimes commuter train. His father was a trolley car motorman in Philadelphia, and his grandfather was a trolley car motorman in Washington D.C. A detailed researcher, Ken's interest in rail transportation by 2013 has culminated in writing 20 books on trolley car systems and railroads covering a variety of locations.